* PW has a list of graphic novels for the Fall -- a number of which aren't graphic novels except in the way my Mom calls them all graphic novels -- that are separated into a laundry list of books by publisher and then a slightly oddball curated top ten that also seems to seek spreading the joy to as many publishers as possible. It's fun to have a couple of lists, though! 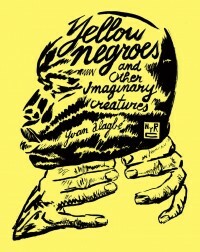 The English language version of one of the best 25 books of the 20th Century, Les Negres Jaunes, is the belle of the ball here. * Paul Gravett peers into the immediate future and describes the awesome comics waiting for us there. * Jordan Commandeur talks to the great Stan Sakai about his next work that encompasses the Teenage Mutant Ninja Turtle into his glorious life's work Usagi Yojimbo. I will buy every comic Stan Sakai ever makes. * finally, here's a preview of Last Song.